Artists Repertory Theatre’s final show of the season, “I and You,” has a synchronicity between the play’s two characters and the actors who portray them. “I and You” tells a funny, tender and surprising story of two young people falling in love with the mystery of human connection. Homebound due to illness, the smart and sarcastic Caroline is suspicious of the sweet and athletic Anthony after being thrown together to work on an English class project about Walt Whitman’s Song of Myself. As the pair stumbles through the poem, they begin to share secrets and let their guards down, eventually unlocking the mystery that brought them together in the first place. 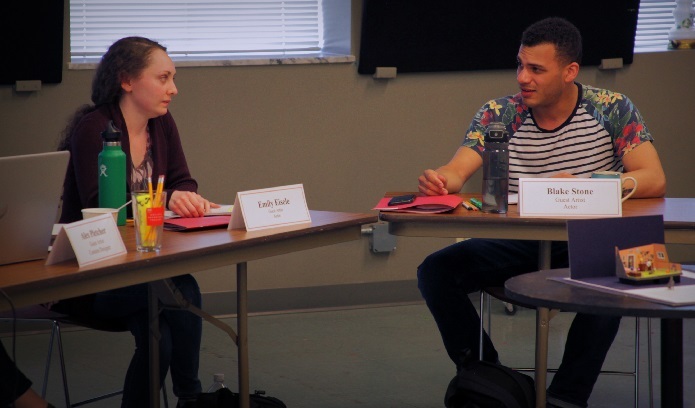 Having never met before they began rehearsing the play, actors Emily Eisele and Blake Stone were surprised to discover the synchronicity in their own lives – including that both have Jewish mothers. Emily agrees. “I always find these sorts of hidden connections interesting,” she says. Though both actors knew their moms were Jewish, religion was not part of either’s upbringing. Blake says the adults in the family often discussed the family’s Jewish roots, and he attended some Passover seders hosted by friends. Her earliest connections to Jewish culture were food. Her Grandma Shirley worked in a kosher restaurant, so on visits Emily would eat plenty of matzah ball soup and challah French toast, which she claims is the only way to make French toast. Thanks to an uncle’s research, she learned her grandfather emigrated from Germany to South Africa in 1938 at the age of 14; most of his extended family died in the concentration camps. The two actors will participate in post-show discussions following the Sunday matinees on June 3, 10 and 17 as well as the Wednesday matinee June 6. WHEN: Through June 17: 7:30 pm, Wed-Sun; 2 pm, Sun; 7:30 pm, Tue, June 12; noon, Wed, June 6.